For 2019 we are interested in adding a small number of new dealers for our paddles in a few areas. We are particularly interested in having a dealer in Florida and 1 or 2 on the US west coast (California, Oregon, Washington State) as well as in the UK and in Scandinavia. You can be a dealer via an existing paddlesports store or just as an active, knowledgeable paddler in your area with a passion for the Greenland style paddle. Contact Joe directly by using the "Contact" button in the top menu bar. January is by far the best time for us to work with potential new dealers and get your new paddles built before the 2019 sea kayak season kicks into high gear. We've now handcrafted well over 1500+ of these over the years and shipped them worldwide. Laminated from 11 strips of wood and hand finished with multiple coats of 100% pure tung oil. Available in non shouldered, shouldered or soft shouldered. custom sizing specs can be worked out via email either before or after placing your order. Order yours today by clicking here. 2 piece Greenland Paddles have become our best selling paddles overall. Spring Sale Pricing are on now! $315.00 for standard ferrule and $325.00 for the XL version. Worth $554.00 at regular prices. Click here to put in your order now. Our top selling canoe paddle the last 2 years, the "Neebing River" canoe paddle. Named for the river located 100 metres from our woodshop/ paddle shop and the first place we test out new paddle shapes. This paddle comes with a blade of roughly 24" X 5.75- 6"(slight variations due to the fact all paddles are completely hand built). Laminated from mainly western red cedar along with a strip of hardwood down the middle for added strength and durability. Available in lengths from 54" to 60"
Our Price $125.00 plus shipping. We decided to start building a YouTube channel and this helps us kick it off. Hoping to do 2 or 3 videos a month from now on. Please go to our YouTube page, Like, Comment and Subscribe. The "Little Joe"...our Youth sized Greenland Paddles. 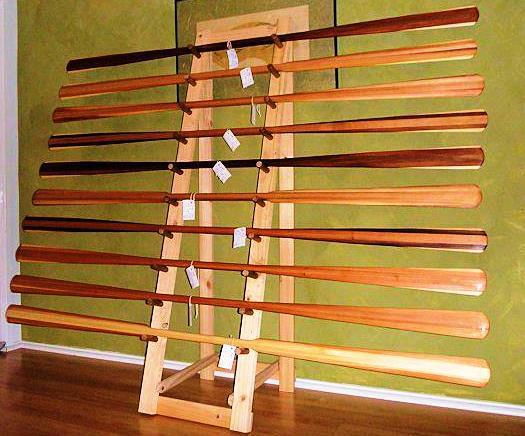 Each paddle built from 11 strips of western red cedar and hand finished with multiple coats of tung oil, these paddles are sized between 170 and 180 cm/ 65 to 71 inches and have loom lengths of about 35 to 42 cm/ 14 to 16.5 inches. Blade widths are roughly 7 to 8 cm/ 2.75" to 3" wide.